The highest quality multi-filament polypropylene and nylon water rescue rope available. The high quality construction of this double braid rope incorporates high twist levels in the sheath to produce a water rescue rope that strong, durable, handles well, and floats. Plus, this water rescue throw line has a higher tensile strength than other polypropylene float ropes. These features make it an ideal and necessary rope for swift water, flood, ice rescue, recreational boating, and other water rescue emergencies. A lightweight addition to any emergency kit carried by police and fire departments, EMS teams, rescue squads, river guides, harbor masters, and the Coast Guard. Non-reflective or reflective river rescue rope great for swift water rescue teams made of polypropylene and nylon strong and it floatsThese lines feature a bright yellow polypropylene sheath for higher visibility and a nylon core for strength and minimum moisture absorption. The 5/16" and 3/8" are ideal for use in throw bags as well as swimmer tether lines and tag lines in water-level pulley systems. The supple nature of these ropes make for easy stuffing and quicker deployment during rescues. Available in spooled and custom cut lengths. Custom colors, different sizes and bulk lengths (over 1,200') available upon request. 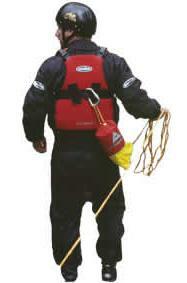 WARNING: Water rescue line should not be used in any vertical rescue, rescue systems, or rappelling activities.